If your dream job involves a combination of work and play, these might be the companies for you. Catering to intelligent young people who appreciate a work-life balance, these corporate offices are injecting some good, old-fashioned fun into the workplace. Would you rather slide downstairs than walk or take the lift? Maybe you’d like to spend your lunch break playing ping pong or table football? Then look into vacancies at one of these companies. It’s a wonder their employees get any work done at all. Here are six of the coolest corporate offices in the world. Google’s insane office spaces are legendary, and rightfully so. From toys to pools to the bowling alley and organic meditation gardens, Silicon Valley’s Googleplex is one of the most amazing office spaces we’ve ever seen. It’s international branches aren’t too shabby, either, with super-plush boardrooms and a cosy library in its London office. The gaming company has a virtual reality-themed California office complete with arcade games and glowing neon features. Bringing your dog to work is encouraged. This alternative clothing company built their office inside an old abandoned cinema. But what to do with the upstairs space where the audience balcony once was? Turn it into an indoor suspended skate ramp, of course. Ever wanted to work in a tiki cabin or a garden shed? 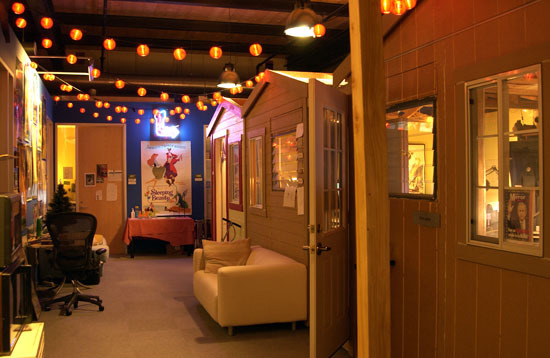 Well now you can at Pixar‘s imaginative, child-like office space in California. The animation company’s quirky, fun building is the brainchild of Steve Jobs. With a massive slide, a tree house, a picnic area and Guitar Hero, who wouldn’t want to come to work every morning for this fun-loving entertainment company? This presentation strategies company has a totally insane office complete with free tattoo parlour, shooting range (if that’s your kind of thing) and fireman’s pole.